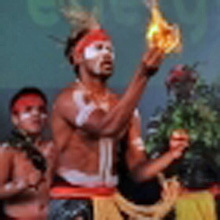 Traditionally celebrated by having a family barbecue or going to the beach, this year’s Australia Day -- marked nationwide on 26 January 2009 -- is all about going carbon neutral for some of the country’s best-known cities, companies and community initiatives. 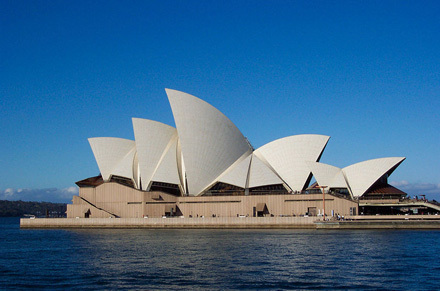 Sydney Opera House, clearly showing the outline of its "sails." Photo by Enoch Lau on 20 July 2004. From the country’s best-recognized cities to one of its most successful public campaigns, these Australian brands have embraced the vision of low-carbon economies and societies by joining the Climate Neutral Network (CN Net), an initiative led by the United Nations Environment Programme (UNEP) to promote global action and involvement in climate neutrality at all levels. “These new Australian members of the CN Net are, therefore, signalling their commitment to a Green Economy so urgently needed in the 21st century—one able to deal with the multiple crises of today and the ones to come. In doing so they are also supporting Australia’s renewed leadership on global warming in advance of the crucial UN Climate Convention meeting in Copenhagen now less than 317 days away”, he added. With its world-famous Opera House, the “Coathanger” Bridge and the Harbour as its backdrop, Sydney is one of the world’s most spectacular cities. In 2007, the City of Sydney became Australia’s first carbon neutral local government. The City is implementing a wide range of initiatives to avoid carbon emissions and respond to climate change – from installing energy-efficient street lighting to creating a network of cycling paths to investigating alternative waste treatment options. Lord Mayor of Sydney Clover Moore said: “The City of Sydney is proud to be the first carbon neutral government in Australia. Though the emissions from the City of Sydney alone are small in terms of state, national and global emissions, we believe that our leadership can influence other governments by demonstrating that change is possible. The UNEP Climate Neutral Network is a significant opportunity to provide information and share experiences with a wide audience." 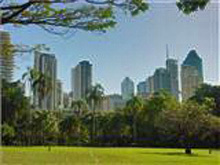 Brisbane is Australia’s third largest city and aims to become carbon neutral by 2026. Through the Green Heart CitySmart programme, Brisbane City Council promotes the use of solar hot water systems after having estimated that traditional hot water systems chew up 28% of household energy consumption. In the area of transport, the city has recently pioneered Australia’s first public bicycle hire scheme and introduced the “superbus,” a 14.5-metre low-emissions bus capable of carrying up to 98 passengers. Another CN Net participant from Brisbane is Greenfest – a three-day-long grassroots, free-to-the-public, music festival which will kick off on World Environment Day, 5 June. This year’s focus of the event is sharing the passion for a cooler planet and creating awareness about the importance of the UN climate negotiations in Copenhagen in December 2009. A further new member is Clean Up the World. The brainchild of Australian solo-yachtsman and builder Ian Kiernan, the Clean Up the World campaign grew from the highly successful Clean Up Australia Day first held almost 20 years ago. Today it mobilizes an estimated 35 million volunteers from 120 countries annually, making it one of the largest community-based environmental campaigns in the world. “Climate change is an indisputable fact, backed up by science. But rather than simply despairing we need to work together to find creative and sustainable solutions that allow us to reduce human impact and learn to live in harmony with our planet. Adopting carbon neutrality as accepted business practice is more than just possible, it’s an imperative. 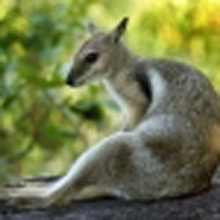 Clean Up the World was established in 1993 after Clean Up Australia founder, Ian Kiernan approached the United Nations Environment Programme (UNEP), with an idea to take his Clean Up Australia concept global. 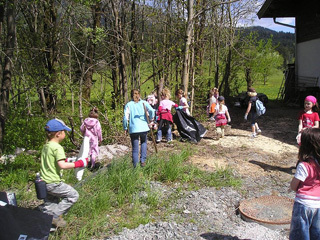 Here children Clean up (Flurreinigung) St. Johann in Tirol Austria Europe 2008 Photo by Eigenes Werk Text Wikipedia. Clean Up the World is proud to be part of a network that encourages innovative thinking, shares experiences and rewards the achievement of practical carbon reduction strategies,” said Mr Kiernan. Based in Adelaide, BalanceCarbon is the first carbon management company formed in Australia by specialist environmental professionals. The company has been carbon neutral since its inception through the combination of greenhouse gas emission reductions and offsets, and aims to reduce its absolute emissions at a rate of 5% per year.